Marriage across racial and ethnic lines continues to be on the rise in the United States. The share of new marriages between spouses of a different race or ethnicity from each other increased to 15.1% in 2010, and the share of all current marriages that are either interracial or interethnic has reached an all-time high of 8.4%. The upward trend of intermarriage is many decades old. 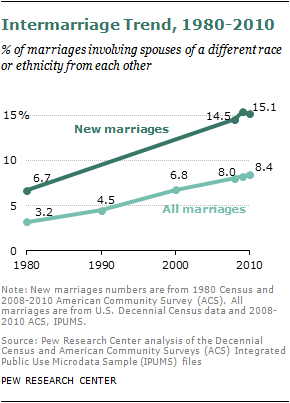 In 1980, fewer than 7% of new marriages were intermarriages, less than half the share now. Among all marriages, the share of intermarriages in 1980 was about 3%. Findings from a number of recent Pew research surveys show that just as intermarriage has become more common, public attitudes have become more accepting. More than four-in-ten Americans (43%) say that more people of different races marrying each other has been a change for the better in our society, while only about one-in-ten think it is a change for worse. Being a minority, younger, more educated, liberal and living in the Eastern or Western states are all traits associated with those who think more positively about intermarriage. Americans’ growing acceptance of intermarriage is echoed on a personal level. More than a third (35%) of adults say they have an immediate family member or close relative who is married to someone of a different race. And nearly two-thirds of Americans (63%) say they “would be fine” if a family member were to marry someone outside their own racial or ethnic group.